The ultimate natural alternative for a healthy prostate. Scientifically designed with 23 ingredients that are used in medical research centers worldwide with significant results. This formula contains plant sterols and sterolins, EFA's and many other nutrients such as saw palmetto used with excellent results to treat Benign Prostate Hyperplasia and other prostate and impotence disorders. 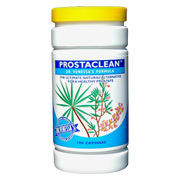 Prostaclean@trade; is the Ultimate Natural Alternative for a healthy prostate! As a daily dietary supplement, adults take 3 capsules one hour before breakfast and 3 capsules one hour before bedtime or as directed by a Heath Care Professional. Store in cool, dry place. other ingredients: stearic acid, magnesium stearate. Prostaclean - is shipped in a discrete, unmarked package. Orders are processed immediately and usually take about 3 to 5 working days to be received. We do ask that you try it for 2 to 3 weeks to feel the full effects. Any information received is used only for order processing and shipping purposes. Your information, such as e-mail address, will never be disclosed to a third party.